Trinity Hall Boat Club has a proud history and remains one of the best student rowing clubs in Cambridge. We pride ourselves on being very welcoming to all enthusiasts, novices and experts alike. 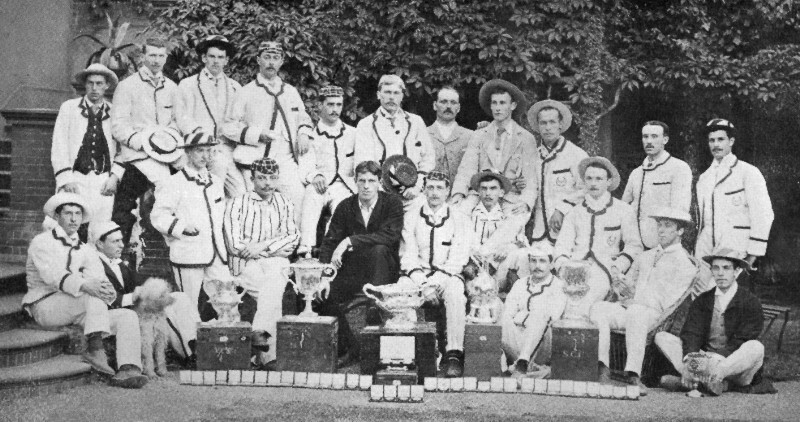 Historically, it is the most successful Cambridge college at Henley Royal Regatta with dozens of Henley wins (Grand Challenge Cup, Stewards Challenge Cup, Silver Goblets, Ladies Challenge Plate, Visitors Challenge Cup, Thames Challenge Cup, Wyfold Challenge Cup...), including all events but one in one year. Over the ten years leading up to the 150th Boat Race, Trinity Hall has been the Cambridge college most represented in the Blue Boat. Tom James, who won gold as part of the Great Britain coxless four at the 2008 Beijing Olympics was a member of Trinity Hall and President of CUBC. In the 2008 Oxford-Cambridge boat races, there were three athletes from Trinity Hall. Many other members have also recently represented Great Britain at Under 23 and at Senior levels, annually. In addition members have recorded recent wins at Henley Royal Regatta and Womens Henley. Trinity Hall is one of the few boat clubs where both first boats (men and women) have been Head of the Cambridge University Lent and May Bumps, dominating the event in the early 1990s; and have always remained among the top college crews. The Club benefits from excellent coaching by former Olympians who rowed for the college, such as Kate Grose; professional coaches like former US international and Goldie rower Ian Coveny; and many former Blues and international rowers. We have a full-time coach and boatman Paul Townshend. As a result, novice and experienced oarsmen alike have an excellent environment in which to improve. Some members of recent Blue Boats actually learned to row here at the Hall. We are lucky to have a fully equipped boathouse on the river cam with a well appointed weights room and a range of boats from VIIIs down to single sculls. Opportunity exists for all levels of experience in this club. Our top boats usually have a healthy mixture of experienced rowers (from backgrounds of school, university, and international level) and people who first sat in a boat at Trinity Hall. You are eligible to race for the Trinity Hall Boat Club if you are in statu pupillari and a member of Trinity Hall. Other members of the university (such as fellows and employees) may also row if consent is granted by CUCBC. You can novice (learn to row) at any time of the year, though most people start at the beginning of each term. We also welcome experienced rowers.